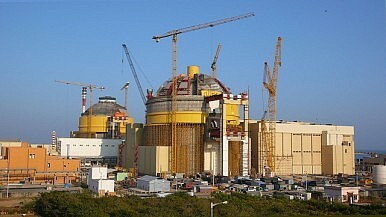 Two Pressurized Water Reactors (PWRs) under construction at the Kudankulam nuclear power plant, India. The increase in uranium supply is a boon to Modi’s energy plans. India, which has increasingly faced an energy-deficit, dealing with blackouts and leaning heavily on coal has begun to focus on building up its nuclear power capabilities in recent years. India has seven nuclear power plants, which operate a total of 21 nuclear reactors. Six more nuclear reactors are under construction. India’s aim is to supply a quarter of its electricity from nuclear power by 2050, an ambitious goal. Last summer, Modi directed the Department of Atomic Energy to triple India’s nuclear capacity to 17 GWe by 2024. Initially, the development of Indian nuclear power production was largely independent. Excluded from the nuclear nonproliferation treaty (NPT) because it acquired nuclear weapons after 1970, Indian nuclear energy development proceeded without external fuel sources or technical assistance. In September 2008, however, the Nuclear Suppliers Group (NSG)–a multinational group formed in 1974 in response to India’s first nuclear weapons test that controls the export and re-transfer of nuclear materials–granted India a waiver, allowing it to engage in international nuclear trade. The waiver came after significant U.S. pressure, most clearly stated in the signing of the Indian-United States Civil Nuclear Agreement in 2006. India now has uranium contracts with Kazakhstan, Russia, Mongolia, Argentina, and Namibia. Kazakhstan produces 38 percent of the world’s uranium–22,451 metric tons in 2013–more than the next three top producers combined (Canada, Australia, and Niger). The country is also set to host the International Atomic Energy Agency’s low-enriched uranium (LEU)bank, a facility which will stockpile LEU, used in civilian nuclear power reactors, in order to assure supply to members should they experience a disruption. India and Kazakhstan also made a number of other agreements during Modi’s visit, covering military cooperation, coordination on counterterrorism, and range of economic and business deals. The uranium supply agreement, between Kazakhstan’s state nuclear energy supplier Kazatomprom and India’s Department of Atomic Energy, is just a small part of increasing cooperation between the two countries.